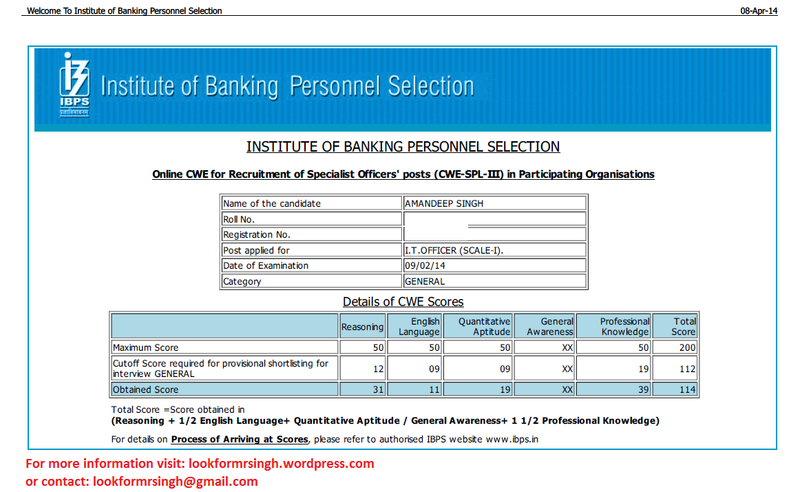 IBPS CWE SPL IT 3 Cut Off – Greaty thinks…………….. I am Subhrajyoti, from kolkata. I follow your blog “lookformrsingh.wordpress.com” regularly and its very useful. I got your email ID form your scorecard screenshot. I have just started preparation for IBPS exam 2015. I need some help from you. Can you please give me light on the below points. 1. Best books to follow, I mean you followed. For quantitative aptitude, reasoning. 2. You got good score in Professional knowledge. Can you tell me which books and which subjects need to be followed. I need your guide very much on this. 3. Also can you please tell me GK and Banking awareness books you followed. 4. Can you please share soft copy of any books you have and you followed. 5. Also any websites, links which can be helpful. 6. Can you please guide me on how to start. Morris Mano for Computer Architecture, etc. book for IT Officer preparation. I will soon upload other books and study material. internet, but I will advise you to just go with trusted websites. 6. Start with building your basics, then do a lot of practice.